The U.S. Food and Drug Administration (FDA) Food Code is a model code and reference document for state and local governments on food safety laws. The FDA Food Code prohibits the sale of food made in home kitchens, which means that most states did the same for many years. In the last decade, however, great progress has been made in adopting “cottage food laws” in almost every state. Each state’s cottage food law is unique to that specific state as there are no federal norms. The one common factor is that the sales of cottage food products are limited to intrastate sales (sales which take place inside of one state). Farmers/producers who live near a bordering state need to take particular note. It is one thing for customers who live out of state to come to your property, or other authorized retail space, and make a purchase. It is a very different thing—and illegal—for the farmer/producer to carry that cottage food product across state lines and sell to customers in a state other than the one where the cottage food was produced. Cottage food laws typically cover non-potentially hazardous foods like baked goods, jams and jellies. These are foods that are not sensitive to time and temperature in the same way as potentially hazardous foods (think fresh baked bread versus a meat pie). However, a producer must look at his/her own state’s definition of cottage food to know for certain which foods are permissible. In a few instances, a state did not include a detailed definition of what a “non-potentially hazardous” food is by statute. 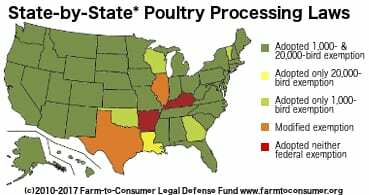 In these states the appropriate government agency (usually the Department of Agriculture) is the best resource for what is considered to be permissible under the statute. 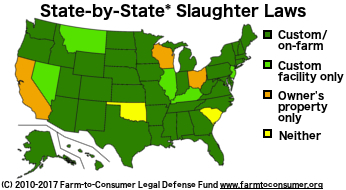 We have included a state-by-state map and further details in the chart HERE. 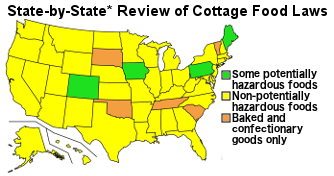 The chart includes the statutory definition of what a cottage food is in each state, as well as permissible locations for sales of cottage foods, and if there are any additional requirements such as licensing or educational components. View the Cottage Foods Map and Chart.